I just finished the update (kernel 4.14.2-1). Out of this I got one thing that is annoying and noobish. The presentation is just horrible after that with light grey text on a white background!!! Not sure how that came about as the console default was white text on black background and I didn't make any changes or customizations. Maybe someone can help? Point me in the right direction? contents of dmesg/message or xorg log are "unremarkable"
Changed Title - Xorg is not installed on system. @digifuzzy, sorry I don't follow, could you paste screenshot(s)? @palica, I'll see what I can do for that. No promises. @palica , I realized that I had made my server setup quite minimal when I followed the install instructions from Funtoo Setup - No Xorg installed. At boot, openrc sequence will start up and the screen will flicker/change. I'm presuming this is where the video driver kicks in (have an Northern Islands AMD video card). 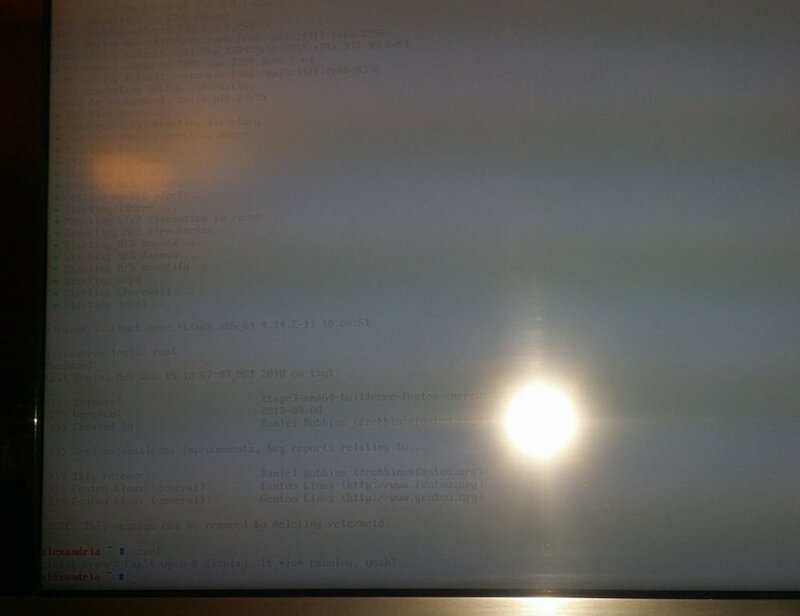 After the timeout for screen blank has occurred, everything seems normal (white text on black background) - this problem exists at boot. Again, this problem was not present prior to the kernel update. I was unable to use scrot to take screenshots and had to resort to my mobile to convey what is happening. what exact graphics card do you have? As for lsmod - using the radeon kernel module. Blacklisting amdkfd did not resolve the observed issue. Not sure if there is something more specific you are asking for from lsmod. can you paste dmesg after reboot, please? [    0.068000] Performance Events: Fam15h core perfctr, AMD PMU driver. [    0.068000] Hierarchical SRCU implementation. [    0.068041] NMI watchdog: Enabled. Permanently consumes one hw-PMU counter. [    0.092671] mtrr: probably your BIOS does not setup all CPUs. [    0.096008] mtrr: corrected configuration. [    1.944172] i8042: PNP: No PS/2 controller found. [    1.944212] i8042: Probing ports directly. [    1.977381] i8042: Failed to disable AUX port, but continuing anyway... Is this a SiS? [    2.238943] microcode: Microcode Update Driver: v2.2. [    2.254516] x86/mm: Checked W+X mappings: passed, no W+X pages found. [    2.406135] libata version 3.00 loaded. [    3.646432] LSI 3ware SAS/SATA-RAID Controller device driver for Linux v3.26.02.000. [    3.677460] 3ware Storage Controller device driver for Linux v1.26.02.003. [    3.708518] 3ware 9000 Storage Controller device driver for Linux v2.26.02.014. [    4.018757] qla2xxx [0000:00:00.0]-0005: : QLogic Fibre Channel HBA Driver: 10.00.00.01-k.
[    4.057761] Copyright (C) 2017 Broadcom. All Rights Reserved. The term "Broadcom" refers to Broadcom Limited and/or its subsidiaries. [    6.565126] usb usb5: We don't know the algorithms for LPM for this host, disabling LPM. [    6.565805] usb usb7: We don't know the algorithms for LPM for this host, disabling LPM. [    9.837779] RPC: Registered named UNIX socket transport module. [    9.837780] RPC: Registered udp transport module. [    9.837781] RPC: Registered tcp transport module. [    9.837781] RPC: Registered tcp NFSv4.1 backchannel transport module. [   10.023444] e1000: Copyright (c) 1999-2006 Intel Corporation. [   10.224235] Loading iSCSI transport class v2.0-870. [   10.677478] AVX version of gcm_enc/dec engaged. [   16.929669] sp5100_tco: Last reboot was not triggered by watchdog. [   17.816614] MCE: In-kernel MCE decoding enabled. [   17.902081] EDAC amd64: Node 0: DRAM ECC disabled. [   17.902083] EDAC amd64: ECC disabled in the BIOS or no ECC capability, module will not load. [   17.940971] EDAC amd64: Node 0: DRAM ECC disabled. [   17.940973] EDAC amd64: ECC disabled in the BIOS or no ECC capability, module will not load. [   17.947561] [drm] radeon kernel modesetting enabled. [   18.004736] EDAC amd64: Node 0: DRAM ECC disabled. [   18.004739] EDAC amd64: ECC disabled in the BIOS or no ECC capability, module will not load. [   18.043627] [drm] initializing kernel modesetting (CAICOS 0x1002:0x6779 0x174B:0xE164 0x00). [   18.044954] [drm] radeon: 1024M of GTT memory ready. [   18.053025] EDAC amd64: Node 0: DRAM ECC disabled. [   18.053028] EDAC amd64: ECC disabled in the BIOS or no ECC capability, module will not load. [   18.100915] EDAC amd64: Node 0: DRAM ECC disabled. [   18.100918] EDAC amd64: ECC disabled in the BIOS or no ECC capability, module will not load. [   18.139609] [drm] PCIE GART of 1024M enabled (table at 0x0000000000162000). [   18.140478] [drm] Supports vblank timestamp caching Rev 2 (21.10.2013). [   18.140479] [drm] Driver supports precise vblank timestamp query. [   18.140525] radeon 0000:01:00.0: radeon: using MSI. [   18.140555] [drm] radeon: irq initialized. [   18.160801] EDAC amd64: Node 0: DRAM ECC disabled. [   18.160802] EDAC amd64: ECC disabled in the BIOS or no ECC capability, module will not load. [   18.332769] [drm] UVD initialized successfully. [   42.412199] Installing knfsd (copyright (C) 1996 okir@monad.swb.de). [   46.773020] Netfilter messages via NETLINK v0.30. [   46.782761] ctnetlink v0.93: registering with nfnetlink. [  116.957565] TCP: request_sock_TCP: Possible SYN flooding on port 59881. Sending cookies. Check SNMP counters. [18687.009199] nf_conntrack: default automatic helper assignment has been turned off for security reasons and CT-based  firewall rule not found. Use the iptables CT target to attach helpers instead. hrm, you are right, nothing strange. Did you try disabling modesetting? I am just guessing now. Can you check the refresh rate of the monitor with ugly screen and after timeout and blank and normal screen? Card is capable of mode setting. I use the same video card on desktop running different linux. The problem I'm pointing out is unique to funtoo environment as my desktop does not show the same behaviour. Unsure of how to obtain refresh rate. Google Search is failing me. All references I can find utilize xrandr or some graphic desktop utility. refresh rate: I was thinking some monitors support this in their OSD. Just to be sure. Funtoo and the desktop environment are working with the same kernel version with the same or nearly the same options? kernel 4.14.12-1 (Arch/Manjaro - OpenRC). xrandr for refresh rate and other useful screen data. of course while X is running,.. your problem looks to be a frame buffer issue. ^^^^^^^^^^^^^^^^^^^^^^? something going on here? - All the settings under "device drivers/graphics support/console display drivers support". - All the settings under "device drivers/graphics support/frame buffer devices"
If there are some differences between the settings for the two kernels, that could explain the different behaviours. I'm not using a custom kernel or customized build settings. I've never changed the FB_RADEON setting. 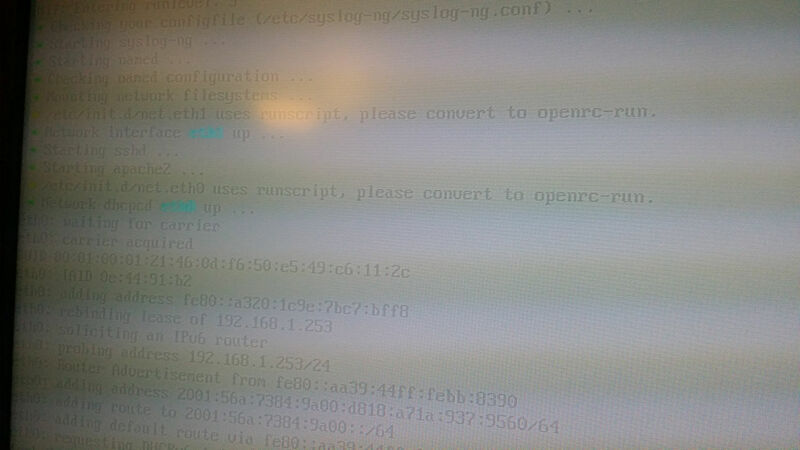 The only change I made recently was an emerge update of sys-kernel/debian-sources to 4.14.2. This emerge also had an update to sys-kernel/linux-firmware - 20180103-r1. Best I can describe the system I have is "stock" or close to it. I thought 4.14.12 was latest stable marked kernel with all the meltdown, spectre patches and that the latest linux-firmware has updated drivers for it. Probably want the latest microcode too. could be some PTI thing?? IDK maybe worth a shot making sure you have latest kernel? just throwing out ideas. That could be the problem because, as far as I know, different distributions can have set different standard settings for the kernel. why don't you try to boot the manjaro kernel and set the root= of the funtoo installation. and let us know how it went. They're separate machines - not practical. fbset not installed on any machine. Currently updating kernel to latest. Updated to kernel 4.14.12-2. No change in appearance at boot. @jhan - they look identical to me. In an attempt to isolate the problem, I downgraded the linux-firmware package (was installed at the same time as the kernel bump when problem was first observed) from 20180103-r1 to 20171206. The problem persists after reboot. Firmware version was restored. tl;dr - somewhere in updating the kernel to the 4.14 series there is a change in how framebuffer/video driver is handled. This problem for the console output (see screen shots above) doesn't appear when using SysRescue CD or on another Linux desktop. No special changes to kernel/framebuffer were used prior to updating to the 4.14 kernel series. This is not a custom kernel. Using setterm --background does not work.